AIM: The aim of this study is the evaluation of the effect of narrative therapy on the resiliency of women referred to counseling centers in Isfahan. METHOD: The study was quasi-experimental, with pretest, posttest, and control group. The statistical population was women who had marital problems and had referred to counseling centers of Isfahan. At first, by the use of available sampling, three counseling centers of Isfahan were selected. Then, by available random sampling, 30% were selected and were randomly put into two groups of experiment and witness. First, all samples answered to the Connor–Davidson's resilience scale. Then, the experiment group took part in eight 2 h sessions of group narrative therapy. And finally, the posttest of both experiment and control group was performed. To evaluate the data and analyze the results of this study, the analysis of covariance was implemented. RESULT AND CONCLUSION: Findings have shown that the process of narrative therapy sessions has had a significant impact on the increase of tolerance (P = 0.001). The results of this study can be implemented in increasing of women's resiliency. Resiliency includes the active and constructive participation of the individual in his/her surrounding environment and his/her ability in establishing of bio-psycho-spiritual balance in high-risk conditions. Resiliency is a phenomenon that can be obtained from normal human adaptive responses and despite the individuals' face with serious threats, empowers him/her to achieve success, and overcome threats. Mere resiliency is not passive resistant against damages or threatening conditions. Further, the resilient person is the active and constructive participant of his surrounding environment. Resiliency is the capability of the individual for establishing a bio-psycho-spiritual balance against high-risk conditions. Satisfaction with life exists when the current situation of the individual in the family is in accordance with what he/she expects to be, and dissatisfaction of life happens when the current situation of the individual in his/her family relations is not in accordance with his/her expected and desired situation. Features such as (1) sense of worthiness, having respect for self, and abilities; (2) the skill of problem solving, flexibility, and finding different solutions for a problem; (3) social competence, the skill of communication with others, and benefit from social protection; (4) optimism, sense of hope, and life target and having goal; and (5) empathy, sense of belonging to individuals and groups is effective in the amount of the individuals' resiliency. In addition to individual features, environmental components such as (1) supportive relationships together with attention, (2) high and reasonable standards and expectations, and (3) creating partnership opportunities in social activities, too, is effective in growth and development of resilient individuals. Studies conducted in the field of resiliency can be categorized into two groups: the first group deals with the determinant factors of resiliency and characteristics of resilient people. The second group includes studies that have put the understanding of the process of the resiliency in their agenda. Some features are potentially trusted in individuals, but their emergence and promotion need more exact recognition, growth implementation. Resiliency refers to the individual's adopting capability in the face of disasters or overwhelming pressures, conquering or even being reinforced by those experiences. This feature is supported and developed with the individual's inner ability and social skills and interaction with the environment and emerges as a positive feature. In the apparent resiliency, something more than resiliency is considered for the inherent resiliency of the human reform itself, and it is an estimate; Werner  states that those who are resilient are more flexible. These people are neither invincible nor immune. Some factors that reinforce resiliency are being focused within the person such as nature of each person, personality and coping strategies, and also variables that are statistically stated such as gender, higher age and higher education, and also some factors have a social tissue, like supportive relationships and access to social ties. Resiliency occurs in each age and level and is a cognitive structure that is teachable. Isen, in his research, concludes that the resilient person takes different reasoning and attitudes, in the face of adverse conditions, in this intellectual processing of focusing on the problem and its consequences, he/she pays more attention to him/herself. Hence, the person can evaluate and process the experiences in a new way, for example, considers a risky position as an opportunity, not a threat, and in difficulties, (he/she) experiences success instead of anxiety. In other words, the executive role and the metacognitive leadership in one's mind give him/her the opportunity to be more discerning. It is one of the prominent features of resilient individuals. Emotionally, resilient people have a placed mood, lack brittle behavior, and have the ability to turn into stressful situations. Matrimonial resiliency includes tolerance of couples in the face of common life adversities without getting any special ill or particular problem. Narrative therapy is the process of helping people to overcome problems through engaging in therapeutic dialogs. A narrative is a form of conversation that connects the events to each other over the time, and so it can show the emotional dimensions of the human existence. The conversations can include sending away of the trouble, extraction of the consequences, highlighting new maps, and connecting it to the past. Narrative therapy deals with individual life stories in the area of the couple's interrelations. Making stories for important events in the couple's interrelations results in success in integration of the subject of intimacy in the positive emotional framework and finally associates with the communicational and psychological welfare of the couples. The narrative therapy believes that people define their life and experiences through narratives. The existence of stories full of trouble leads to problems and psychological changes, and problem solving, too, would be possible through troubled narrative. Narrative therapy looks for narrations that form the relation between couples in matrimonial relations. Moreover, seeks to facilitate the process of cooperative rewriting of troubled narrations of them. In this approach, the clients and the therapist are actually the editors of the private life of the clients, and therapy is the edition of the private life, in other words, provides an active role for the clients in therapy. In this method, the person learns to undertake the responsibility of himself/herself in relieving and improving psychological problems and practices it. Because, when writing the life story, the person is thinking to it simultaneously, he/she chooses some parts of it and puts away not so important parts, in fact, he/she becomes the editor of his/her own story, and this is what is emphasized in this approach, i.e., people should arrange and edit their life story. The studies showed that couples who had the ability to express and deal with narrations and stories of past life, better deal with the current events. Expression of life story can be a solution for therapists in improving the matrimonial solutions. The therapists help the families in the process of narrative therapy sessions to make new stories and for this task, want them to state specific and unparalleled results (like the situation in which the family reaches its goal with its solutions). The aim of these interventions is to help the clients to externalize and overwhelm problem. Eskandarpour  addressed the evaluation of training narrative therapy on the decrease of the couple's marital dissatisfaction, and the results showed that group training of narrative therapy leads to decrease of the couple's matrimonial dissatisfaction. The study of Banker et al. showed that encouraging the couples to write their stories can inform them of the dominate culture on their stories and prepares the couples for selection, protection, or change of the meaning of their matrimonial life stories. The research showed that understanding the language of the other party can help the couple to improve their cordial relationships. The couple who have the ability to express and deal with the inefficient narrations of past life can better deal with the current events of life. For those who stated their sense of security and trust in their past life and before marriage, had the same expectations in their current life and reported a more matrimonial satisfaction in their intimate relations. In a research by Tir-Tashi and Kazemi, over the impact of narrative therapy on the amount of their tendency to forgiveness, they found that narrative therapy as a tool to enhance the women's tendency to forgive can be effective, i.e., women who participate in the process of narrative therapy showed more willingness to forgive others. This study is a quasi-experimental study with pre- and post-test, and control group. The population included women who had matrimonial problems and had referred to counseling centers of Isfahan in 2015. To conduct the research and considering the researcher's accessibility to counseling centers of region 8 of Isfahan municipality and due to the cooperation of three counseling centers with the researcher, these centers were selected for choosing among participants and training. Of the women who had attended, 30 of them were simply selected randomly, and 15 of them were randomly placed in the experiment group, and the other 15 were in the control group. After selection of the sample and assigning of the experiment and control groups randomly, Conner and Davidson's questionnaire (25 questions) was applied as a pretest for both groups. Group training of narrative therapy was done for the experimental group for eight sessions of 2 h, and immediately, at the end, the educational program and control and also, content validity of the narrative therapy were conducted that was based on the approach of narrative therapy and social structures. The criteria for inclusion and participation in research were having matrimonial problems, not use of other psychological treatments simultaneously, literacy to read and write and their consent for participation in the sessions, and the possibility to take part in group therapeutic sessions continuously. members were asked to express their aim of taking part in this workshop/expression of the fundamental laws of the workshop by the researcher/regular attendance doing the weekly tasks/having open communication and activity in the group/having coordination in the activities/expression of privacy principles and the value of training for the members/doing the following activities: (1) extending the life story and dedicating a starting point to it and (2) drawing the life story. sufficient description about aims, values, and the therapeutic content/creating a common position in the treatment and centeredness of the clients/stating of a problematic story/listening carefully to the details of clients' language/common naming of the problem with priority given to words, and the clients' language/assigning homework: tracing a positive future: what positive event do you like to happen in your life story/tracing and description of negative future in marital life. description of problematic stories with more details and more complete by authorities: when, who, and with what meaning; how long the problem happened/careful listening to the language, words, and metaphors of the clients/use of externalization; and isolation of the problem from the clients' identity and relations/reviewing of the stated narration of each of members from other members' view. encouraging the clients to description of short narrations and externalization of the problem (that the individual distinguishes a difference between the problem and him/herself) and method: (was) asking questions that individuals change traits that they attributed to themselves. Moreover, the use of metaphors/encouraging the clients to clear the reaction and their ideas toward these problems and events through effective questions/challenging the problematic story. naming the problem/deconstruction of the narrations that have problem/re-meaning or re-labeling for the problem, expressing alternative and preferred narrations/help to learn, to gain power, feeling of personal functionality, and hope in the clients through discussing exclusive consequences/encouraging members to have an inconsistent behavior with the story that is full of problems in the interval between sessions/assigning task: the subjects should write and re-label five cases that happen to them as a problem in their lives during the week. questioning the clients about the exceptions and exclusive cases (when the clients are not under the pressure of the problem)/focus and emphasis on details, feelings, thoughts, and behaviors of these exclusive cases; extension of these exclusive cases to the present time/continuation of deconstruction/extension of the alternative narration through questions of action prospect, and questions of consciousness prospect. returning to traumatic events/sharing one's story with other members of the group/talking about important persons in his/her life in the past and present to remind the unsolved problems/the variety of skills include: (1) the skill of speaking: each person should talk/describes his/her intuitive information/express thoughts/express feelings/projecting the demands, (2) skills of listening: paying attention/listening/looking/confirming the experiences/summarizing the content to make sure of their correctness/re-asking the question/requesting the clients to write a not mailed letter. Forgiving, forgetting or giving up bullying, and misusing people and those who caused unpleasant memories for the clients. Reviewing the memories and possible actions of the clients about the possible tasks of the previous session/talking about positive experiences and alternative narrations/retelling and stabilization of alternative narratives/confirmation of alternative narrations of the clients/evaluation of the results obtained from narrative therapy and elimination of the deficiencies/most of the narrative therapy includes telling and re-telling. The treatment is finished when the client feels her narration has changes. Data obtained from pre- and post-test were done through multivariate covariance analysis. Data analysis was conducted by the SPSS 21 software (IBM SPSS Statistics, 2009). Descriptive findings of the variable of feeling lonely in two stages of pre- and post-test related to both the experiment and the control groups are shown in [Table 1]. According to the obtained results in [Table 1], the mean of scores in the research variable and its subscales in the posttest stage was higher for the experiment group than the control group. In a comparison of the mean of pre- and post-scores in both groups, it is observed that in the experiment group, the mean scores in the research variable is higher in the posttest stage than in the pretest stage. However, in the control group, scores of posttest have had a very little increase or has remained unchanged than scores of pretest. 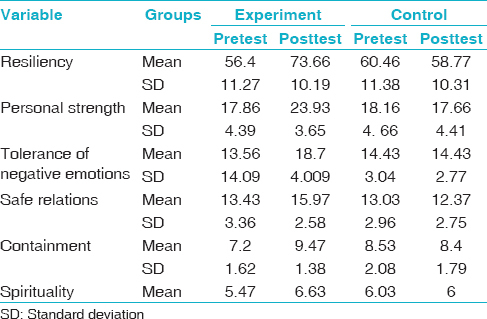 Based on the results in [Table 2], the mean score for personal strength, tolerance of negative affection, safe relations, containment and spirituality in both groups, experiment and control, is significant in the posttest stage (P = 0.001). In other words, it can be said that narrative therapy has improved the scores of personal strength, tolerance of negative emotions, safe relations, containment, and spirituality in the experiment group in the posttest stage. The amount of impact of group membership or narrative therapy in improving personal strength, tolerance of negative emotions, safe relations, containment, and spirituality in the experiment group in the posttest stage. The amount of impact of group membership or narrative therapy in improving personal strength, tolerance of negative emotions, safe relations, containment, and spirituality has been equal to 79.5%, 70.8%, 67.4%, 42%, and 24%, respectively. Based on findings in [Table 3], the mean scores have significant relation with posttests in all subscales of resiliency. By controlling this relation, the results show that all subscales have a significant difference in posttest stage in both groups of experiment and control (P = 0.001). The results have shown that nearly 85% of individual differences in five subscales are related to the difference between the two groups. Therefore, the hypothesis of the study is confirmed. Besides, the statistical power equals to 1.000 that while it shows the high accuracy of the test indicates adequacy of sample size for evaluation of the hypothesis. This study was done with the aim of (observing) the effect of narrative therapy on resilience of women clients of counseling centers in Isfahan. Based on findings, it was concluded that narrative therapy increases women's resiliency. The findings of this study were in line with the results of similar studies in this field including Banker et al., Pour, Khodabakhsh et al., and Tir-Tashi and Kazemi. In explaining this hypothesis, it can be said that narrative therapy provides this possibility for women to identify internal unpleasant experiences without any effort to control them, doing so makes the experiences seem less threatening, and their impact on the individuals' lives will be less. The ultimate goal of this approach is well-being and happiness of women; hence, the factors that lead to greater compliance of individuals with the requirements and threats of life are of understudy structures of this educational method. Narrative therapy processes also include telling, listening, re-telling, and re-listening of stories. These stories give materials and resources to trace meaning, understanding, and insight. The main part of the treatment is helping the individual to understand the relationship of her stories with others and with her own life. In fact, what is important is discovering the style of the story. The main emphasis of narrative therapy is on interpretation or meanings that people ascribe to the events of their lives. Understanding the interpretation that people have of the events can limit or expand their actions. Narratives help clients to reach to broader and more comprehensive interpretation of the limits and positions when looking at them from a broader narrative understanding, aspects of themselves that were covered by limiting interpretations, are allowed to be seemed. Narrative therapy improves women's compatibility, their use of resources, and their ability to pass through difficult times when suffering a stressor family situation. Clinically, the intention is to train women to gain features such as prediction, persistence to overcome obstacles, tolerance against failures and problems, and self-efficacy that all help her in difficulties and make her resilient. Resilient women take a different way of reasoning and attitude in facing adverse conditions instead of making tragedy of a problem and getting caught in its consequences, pay more attention to themselves and their abilities. For example, such people may consider a hazardous position an opportunity not a threat, and in difficulties, experiences success instead of anxious. Hence, resiliency leads to appropriate adaptation in facing problems, and it is something more than a simple avoidance from negative consequences. Although the change in emotions could lead to the change in attitudes about the phenomenon, change in emotions is rooted in a set of skills and capabilities, and these capabilities are teachable. Therefore, by narrative therapy, it is possible to create positive feelings and attitudes in people, increase their level of mental health and hence increase their resilience. It seems that in this educational intervention the aim is to establish the foundation of women's resources for a more effective encounter with psychological pressures and a stronger rebound to its initial state, both individually and as a communication system. The present study, in line with other studies, and due to the broad concerns about family disintegration, more than ever emphasizes the importance of educational processes that can help couples strengthen their relationships. In this study, too, like other studies done in the field of psychology and behavioral science, there were some limitations including the resistance of individuals in expressing narrations in group and that the present study is done about women of Isfahan, and there should be caution in generalizing the results to other cities. Moreover, lack of follow-up stage caused the persistence of therapeutic effect not to be measured in this study. According to the finding of this study, it is suggested that in premarriage training and counseling centers, make use of the practices of this treatment as management solutions of marital life for the improvement and continuity of the lives of young couples. It is suggested that in future research this method is also utilized for solving other problems of women. Samani S, Jowkar B, Sahragard N. Effects of resilience on mental health and life satisfaction. Iran J Psychiatry Clin Psychol 2007;13:290-5. Shakibia T. The resiliency. J Teach Dev 2009;18:2-12. Jowkar B. The mediating role of resilience in the relationship between general and emotional intelligence and life satisfaction. Contemp Psychol 2008;2:3-12. Diener E, Lucas R, Schimmack U, Helliwell J. Well-Being for Public Policy. New York: Oxford University Press; 2009. Werner EE. What can we learn about resilience from large-scale longitudinal studies? In: Goldstien S, editor. Handbook of Resilience in Children. New York: Kluwer Academic/Plenum Publishers; 2005. p. 87-102. Bonanno GA. Loss, trauma, and human resilience: Have we underestimated the human capacity to thrive after extremely aversive events? Am Psychol 2004;59:20-8. Foroghi M. Investigating simple and multiple relationship between family and resiliency factors on high school students in Isfahan. Isfahan: University of Isfahan; 2014. Isen AM. Positive affect, systematic cognitive processing, and behavior: Toward integration of affect, cognition, and motivation. In: Dansereau F, Yammarino F, editors. Multi-Level Issues in Organizational Behavior and Strategy. London, Oxford, UK: JAI/Elsevier Science; 2003. p. 55-62. Kabat-Zinn J. Coming to Our Senses: Healing Ourselves and the World Through Mindfulness. NewYork: Hyperion; 2005. Zust JC. A cognitive path through resiliency. New York: Hyperion; 2010. Letzring TD, Block J, Funder DC. Ego-control and ego-resiliency: Generalization of self-report scales based on personality descriptions from acquaintances, clinicians, and the self. J Res Pers 2005;39:395-422. Naziri G, Ghaderi Z, Zaree F. On the effectiveness of narrativetherapy approach in reducing women's depression a case study of Marvdasht women. Q J Woman Soc 2010;1:65-78. Josselson RE, Lieblich AE, McAdams DP. The Meaning of Others: Narrative Studies of Relationships. Washington, DC: American Psychological Association; 2007. Frost DM. The narrative construction of intimacy and affect in relationship stories implications for relationship quality, stability, and mental health. J Soc Pers Relat 2013;30:247-69. Tir-Tashi EN, Kazemi N. The effectiveness of narrative therapy on amount of forgiveness in women. J Clin Psychol 2012;4:71-8. Banker JE, Kaestle CE, Allen KR. Dating is hard work: A narrative approach to understanding sexual and romantic relationships in young adulthood. Contemp Fam Ther 2010;32:173-91. Wamboldt FS. II. Co-constructing a marriage: Analyses of young couples' relationship narratives. Monogr Soc Res Child Dev 1999;64:37-51. Skerrett K. “Good enough stories”: Helping couples invest in one another's growth. Fam Process 2010;49:503-16. Goldenberg H, Goldenberg I. Family therapy: An overview. Belmont. 7th ed. USA: Thomson Higher Education. EngageLearning; 2012. Eskandarpoor N. The effect of narrative therapy on the reduction of the couple's marital dissatisfaction. The first international conference on psychology and behavioral sciences. 2014. Khodabakhsh M, Kiani F, Tirtashi EN, Hashjin HK. The effectiveness of narrative therapy on increasing couples intimacy and its dimensions: Implication for treatmen. J Fam Couns Psychother 2015;4:608-32. Carr A. Michael White's narrative therapy. Contemp Fam Ther 1998;20:485-503.